Who are the Tea Partiers? 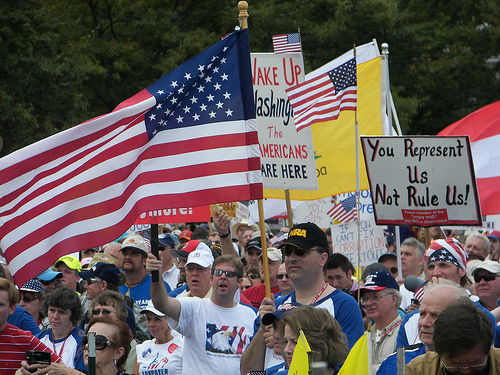 As of April, 18% of the American public said they identified with the Tea Party. Of those who did, most were wealthier individuals: over 30% made a family income of over $75,000 a year, while a whopping 12% of Tea Partiers’ families made over $250,000 (in contrast, only 1% of the wider American public share that privilege according to the U.S. census bureau). Additionally, supporters of the Tea Party are predominantly older, white, and male. (75% are 45 years of age or older, 89% are white, and 59% were male). According to an April CBS poll of Tea Party supporters, proponents primarily wanted to reduce the scope and size of the federal government. Largely, this is because of an opposition to the economic legislation the Obama administration has enacted, as well as a host of misconceptions and prejudices (the belief, for example, that Obama has raised taxes for most Americans, or that “too big a deal” has been made of the plight of blacks in the U.S.). This anger towards the Obama administration, stoked by right-wing media, has been mobilized by organizers from FreedomWorks – a right-wing community organizing campaign used to get out the vote for Republican Politicians. 80% of the Tea Party movement believe that there is at least “some,” or “a lot” of difference between their movement and the Republican Party – and yet the Republican Party (with significant aid from FreedomWorks, who spent more than $10 million on mobilizing Tea Partiers to support Republican candidates) has managed to harness their vote, and ride it on a wave of victory to Washington. For the most part, in fact, Tea Party politicians are Republicans – only in a few states (Nevada and Florida) are there registered Tea Parties running candidates. Where there were registered Tea Party candidates running, moreover, they were largely doing so as spoilers, and not because they believed they could win. Out of 10 Senate Candidates backed by the Tea Party this mid-term election, for example, the five who were elected to office are members of the Republican Party. Of the 130 politicians backed by the Tea Party for seats in the U.S. House, again, all 40 of the winning candidates were Republicans. It is not so much an upset, then, that so many Tea Party backed candidates won seats in the last midterm election. The vast majority of the politicians who have been elected are, for all intents and purposes, fairly typical Republicans. It was really more a case of the Republicans taking advantage of the Tea Party than it was of the Tea Party taking advantage of the Republicans. Nowhere is this more evident than in the contrast between anti-elitist rhetoric in the Tea Party and the reality of a wealthy minority bankrolling the electoral operations of the movement. Of the Tea Party politicians poised to take their seats in the nation’s capitol, perhaps the most blatantly opportunistic is Pennsylvania Republican Pat Toomey. Hardly the rebel upstart media pundits would like to paint him as, Toomey is as Wall Street as they come. Formerly a derivatives trader at Morgan Grenfell, a British financial firm, Toomey helped pioneer some of the riskiest new financial instruments that contributed to the 2008 economic catastrophe. The financial industry, for their part, has been more than willing to support “one of their own,” donating hundreds of thousands of dollars to his campaign. Top amongst them has been the Elliot Management Corporation, a major Wall Street hedge fund and derivatives trader owned by conservative capitalist Paul Singer. For all the heated campaign rhetoric amongst politicians on the left and right, there are striking similarities between the tactics of the Tea Party movement and more established progressive organizations (such as the AFL-CIO). Both are essentially trying to change the direction of one of the nation’s two political parties – one trying to push the Democrats, the other trying to push the Republicans – and both rely heavily on streamlining a sort of “professional activism,” where volunteers are quickly plugged into massive, coordinated canvassing and phone banking projects to get out the vote. The Tea Party’s co-optation by the Republican Party is useful to us on the left because it demonstrates that for people who have fundamental disagreements with the established order – whether they be right-wing libertarians or anarchists – there are certain political strategies conducive to changing the system, and certain strategies which will never work (namely, direct action or electoralism). Herein lies the good news: although the media has hyped up the “Tea Party upsets” in the last midterm election, we can proceed with great confidence that it will meet with the same failures which have plagued progressive organizations such as the AFL-CIO – namely, that candidates who are elected to public office will cave to the pressures of well monied interests and uphold the status quo. Far from being the beginning of a serious right-wing movement capable of reforming the U.S. Government in its own image, the Tea Party could more aptly be described simply as a failed libertarian electoral campaign, who influenced the policy of the federal government in 2010 only insofar as their participation in the elections could be used by the Republicans. For a salaried worker, conservatism is the default position : you want your salary to come in every month, and therefore, it is in your interest that the firm which pays you continues to exist. That is the big stick hanging over all our heads. As for the Tea Party, it looks like a bunch of millionaires trying to push the billionaires, while the billionaires whistle ideas in the millionaires' ears. In any case, we're in for a lot of hard times, deflation and deleveraging, austerity measures and unemployment leading to revolts and the repression that goes with revolt. Demand destruction will lead to supply destruction, and the whole kaboodle will lose several degrees of complexity. Where arms are available, maffia-style societal arrangements will arise amidst the ashes, and we'll be lucky if we can create a few 'humanistic' societies on the debris of capitalism's collapse. "You represent us, not rule us."